Ph2 engine electronic start- valve clearances checked, compreesion very good in both cylinders. Each cylinder will keep the engine running on its own when the decompreesuon lever is rotated on the other cylinder which indicates that both cylinders are giving equal power. The problem is that When the engine is revved high, under load or not under load, it will pour out black smoke. On idle the engine runs very well with clear exhaust. Would anyone have an idea how to fix this? It is possible too that the exhaust system is carboned up either in the heads or manifold or the exhaust pipework itself. These engines are prone to this problem and this will cause black smoke. I think it is far more likely that the maximum fuel setting is wrongly set causing the engine to over fuel. I have to go out singing this evening so I have no time to explain how to set the pumps up now, but I will post this info. either later tonight or tomorrow morning. The whole engine has all new filters. The injectors were checked also. It does feel like a max fuel issue. Please explain fred when you get a chance. Each injector pump has a calibration mark on the rack which is used to set the fuel delivery. This mark will be under the rubber boot, (seal), if yours are still fitted you will have to remove this seal to set the pump. To check or set the pumps start from the flywheel end. Make sure the rack is pushed fully towards the flywheel and that there is no clearance between the rack extension and the bolt and locknut in the end of the operating arm. The calibration mark should then be 1/2 inch,(12.7 mm) from the pump body. See pic. below. 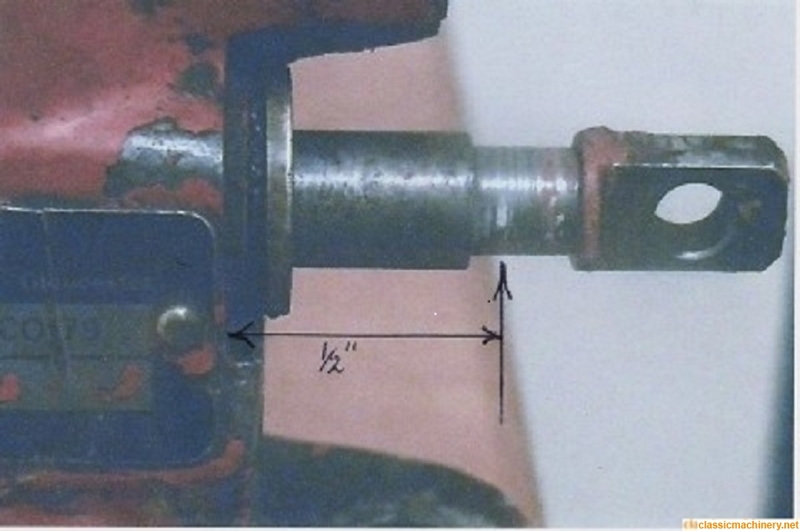 The measurement is taken from the pump body where the brass bush is fitted into it, not from the bush itself. This setting is obtained by loosening the locknut and adjusting the bolt in the operating arm. The second pump is then set by adjusting the link between the two pumps to acheive the same setting as before. It will be easier to remove the overload stop, (cold start device), whilst doing this.Take care not to disturb the first pump setting whilst setting the second. Refit and set the overload stop, ( which ultimately controls the smoke), by screwing in the bolt against the stop plate until the calibration marks are 13/16 inch, (20.6 mm.) from the pump face. Run the engine and readjust the screw, (out), till the you get black smoke on acceleration and then back in till the smoke just clears. Play with this adjustment till you are happy with the engine performance.